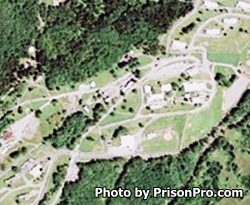 Otisville Correctional Facility is located in Orange County New York. It is a medium security facility that houses adult males. The maximum capacity of Otisville Correctional Facility is 513 inmates. The facility is secured by razor wire fencing and armed horse mounted guards. At one point in this prison's history, inmates were allowed to work in a sawmill and in the production of maple syrup. Today vocational training is offered in small engine repair, horticulture, building maintenance, and masonry. One of the more unique programs at this facility is the puppies behind bars program, which allows inmates to work training dogs. Inmates can earn a GED while incarcerated and private funding has made it possible for inmates to take college courses through John Jay College. Additional programs offer inmates substance and alcohol abuse treatment, and life/problem solving skills can be obtained through the Compadre Helper Program. Visiting at Otisville occurs on Saturdays, Sundays, and Holidays from 9am-3:15pm. Visitors will not be processed into visitation if they arrive after 2:40pm. The maximum number of visitors an inmate is allowed per session is four.